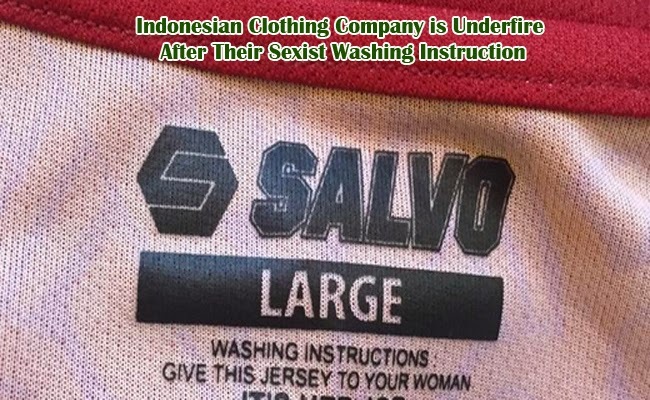 An Indonesian clothing line is underfire after netizens all over the globe called foul on what seemed to be a sexist statement printed as a clothes’ washing instruction. The instruction says that men should give the jersey to his woman because it is her job to wash it. The shirts of Salvo Sports Apparel created for Pusamania Borneo, an Indonesian Super League team, had caught fire online. Due to the number of criticism on the shirt, Salvo Sports Apparel posted a public apology in its Twitter account on March 8, 2015. According to Salvo Sports, the actual message was the exact opposite of how people interpreted it. While many say that it was offensive to women, the management said that they were trying to express that women are more knowledgeable when it comes to washing. Furthermore, the management of the apparel explained that by men giving their laundry to women, it could save time fussing over the problem as women can easily tackle it. It also tells men that they should take care of their clothes just how the women does. However, even the explanation and apology seemed to be not so well received as some say that the printed instruction would then seemed to be a compliment in a sexist way. On the other hand, others say that their apology seemed to generalize both genders in a manner that seemed unacceptable. Salvo Sports stood its ground that the message had been misinterpreted as it was done to give a positive statement for women and not to humiliate them.